March 21 is celebrated as Human Rights Day in South Africa. On this public holiday, we should reflect on the country’s past and celebrate the diverse nation, Nelson Mandela referred to as ‘Rainbow Nation’. South Africa is a country with a rich cultural history and manifold cultural influences originating from many different nations. Many diverse cultural groups, all with their own traditions and customs, live together in this country. This raises naturally the question how these people interact with each other today and if there is racism still evident in the county? Can South Africa really be referred to as a ‘Rainbow Nation’? During our ten year stay in Cape Town, we were exposed to a wide variety of experiences, good and not so good ones, but it really comes down to the South African people who made us work through some difficult times and made us stay. South Africans, of all races, have been welcoming us with open arms and warm smiles, something which we have not experienced to this extent in the other countries we lived in. However, it always helps to show respect and tolerance to each other, whatever the race, culture or social background. 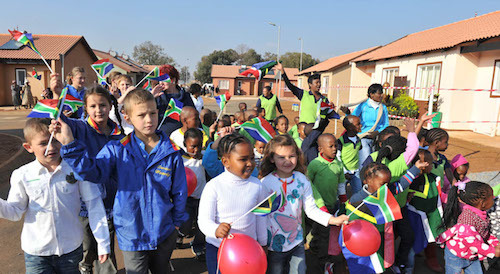 Living in a diverse society as Cape Town offers also helps to teach our children respect of others who are different. Racism is unfortunately evident in some form or other, but this can be experienced in other countries as well. People of different cultures and backgrounds are discriminated against for a variety of reasons. However, in Cape Town, it is great to see transformation taking place. The school we choose for our children is a perfect example. The kids mix and mingle, there is no racial discrimination separating the kids anymore and children do not see colour lines if they are taught to say no to racism and accept each other from the early years on. Sports and cultural activities certainly help in achieving a team spirit and the kids just take their experiences from the athletics track or soccer field to their classes and home. It is wonderful to experience how the children enjoy playing together and learning from each other. This togetherness is enjoyed by us parents who hail from so many different backgrounds as well and we celebrate multicultural school events together or meet each other at play dates we arrange for our children. This is true transformation which can be see in tolerance and respect for each other. Truly a Rainbow Nation alive! Read our expat's view on racism in South Africa here. Human Right’s Day, South Africans refer to it as Sharpeville Day or Heroes’ Day as on this day in 1969 the Sharpeville massacre took place when South Africans were protesting against Apartheid pass laws which restricted movement of the country’s black population. On this day 69 unarmed protesters lost their lives as they were gunned down by police forces. Did you know that it was in Sharpeville that South Africa’s first consititution was signed by Nelson Mandela in 1996! Celebrate this public holiday in the Mother City and mingle and mix. Meet new people and make new friends. Cheers for the brave swimmers at the Human Rights’ Day Swim which takes place in Camps Bay. From 10h00 at the beach. Enjoy the spirit and atmosphere in Cape Town!